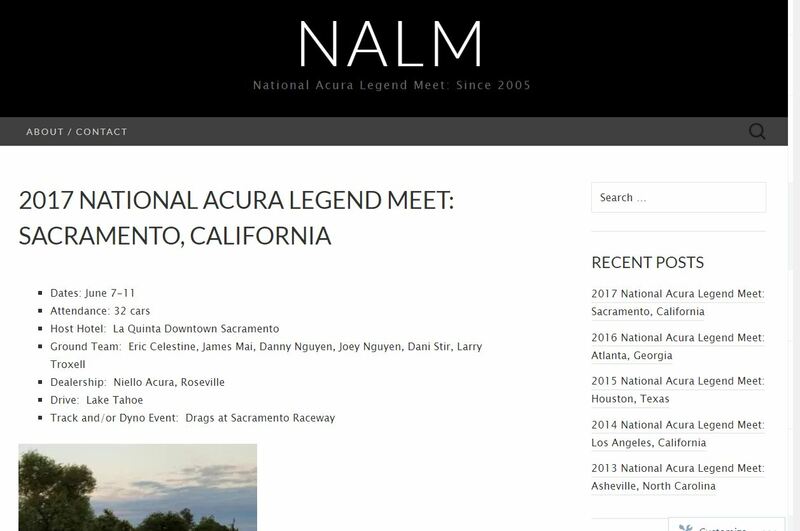 It’s already time to kick off bidding for next year’s nerdy Legend extravaganza, otherwise known as NALM (the National Acura Legend Meet). The event has taken place for 13 consecutive years now, spanning the country from California to New Jersey and many places in between. I haven’t missed one yet. Here’s a website I’ve been managing the has a few highlights and photos/videos from each of the events. And to get us in the spirit of things, here’s a blast from the past: A 7-minute video capturing scenes from the event’s first program from May 27-29, 2005 in Dallas, Texas. Special features include a car wash activity, close-ups of some special “custom” Legends, autocrossing action shots, the banquet dinner, and a night out on the town. Check out event organizer Lee Horton getting sideways in his G1 coupe at around 5:30. My coupe had around 171,000 miles on the odometer. I also happened to come across this video of destruction of a G2 sedan while browsing the ‘Tubes. Watch at your own discretion; it’s a little graphic! And finally, on a brighter note, check out this video my friend Pat put together of his absolutely stunning 1994 Legend GS 6-speed sedan. Drool-worthy for sure. Happy Thursday, enjoy the rest of your week, and keep on driving. This entry was posted on December 7, 2017 at 7:48 am and is filed under NALM, Throwback. You can follow any responses to this entry through the RSS 2.0 feed. You can leave a response, or trackback from your own site. Ugh, that Legend destruction video was PAINFUL. Although a testament to the design that it took all that punishment… and credit to the driver for drifting it around that one corner. Looking forward to your NALM adventures! Haha yes. And you have to admit, he got some pretty good air, and I’m glad to see that even after all those years and all that destruction, his airbags still worked! You know after reading so many of your posts like this it finslly dawned on me that for all it’s popularity there are no large scale national Accord organizations. You’re right. With the sheer volume of Accords out there, I suppose it makes sense that owner groups would be more regionally-focused or generation-focused rather than trying to accommodate a “nationwide” gathering. I’ve heard of groups like 3geez.com which is a forum specific to the pop-up headlight Accord generation like your old 1989. But I don’t know of any (then or now) meets for that group. The only real reason such an idea was “born” for the Legends was because of one guy, Lee, who had the idea of planting an all-Legend gathering one summer in the middle of the country. The idea worked, it caught on, and here we are 14 years later. I’m actually going to be helping put together a bid for next year, for Colorado Springs, with the signature aspect of the event being a drive up Pikes Peak. Compared to the 2005 meet, has the event grown since? It’s great to see fellow Legend enthusiasts out in force. Are they likely to run an autocross this year? Hope your weekend is going well. Adam. Hmmm are you going to see a bid for Colorado Springs? Yes! I spoke with Alan Jackson about it this week. Things are well underway for that.